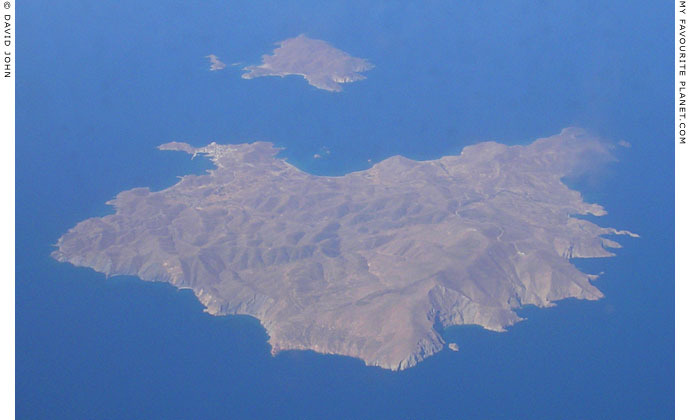 Aerial view of the Northern Aegean island of Psara and the smaller Antipsara from the east. of the long headland on the southwest coast (centre left of the photo). Like some of the other small islands in the eastern Aegean, such as Agios Efstratios (which has a similar size), Psara is arid, windy and rugged, formed by volcanic rocks which rise steeply from the sea. A poor place for agriculture, its inhabitants made their living from the sea as fishermen, sailors and merchants, and its history followed the ups and downs of other small communities at the mercy of successive invaders and pirates along the strategic sea routes between Anatolia (Asia Minor), Greece and the Black Sea. The island has been inhabited since Neolithic times, and remains of a wealthy Mycenaean settlement (14th-12th centuries BC) have been discovered at Archontiki (Αρχοντίκι) on the west coast, as well as Hellenistic remains at Palaeokastro. Archaeological finds from Psara are in the small museum in the village and the Archaeological Museum of Chios. In 1821 Psara joined the Greek side in the Greek War of Independence against Ottoman Turkish Empire, and the Psariot Constantine Kanaris (Κωνσταντίνος Κανάρης, circa 1795 – 1877, later prime minister of Greece) became one of the important naval commanders in the sea battles which followed (see also Samos gallery page 13). On 21st June 1824 the Turkish fleet attacked the island and destroyed the town. An estimated 15,000 inhabitants were killed, and the survivors enslaved. Those who managed to escape the catastrophe resettled in Monemvasia in the Peloponnese and Eretria on the island of Euboea, where they founded the village of Nea Psara (Νέα Ψαρά, New Psara). From 1864 some of the islanders returned home, and slowly repopulated the island. 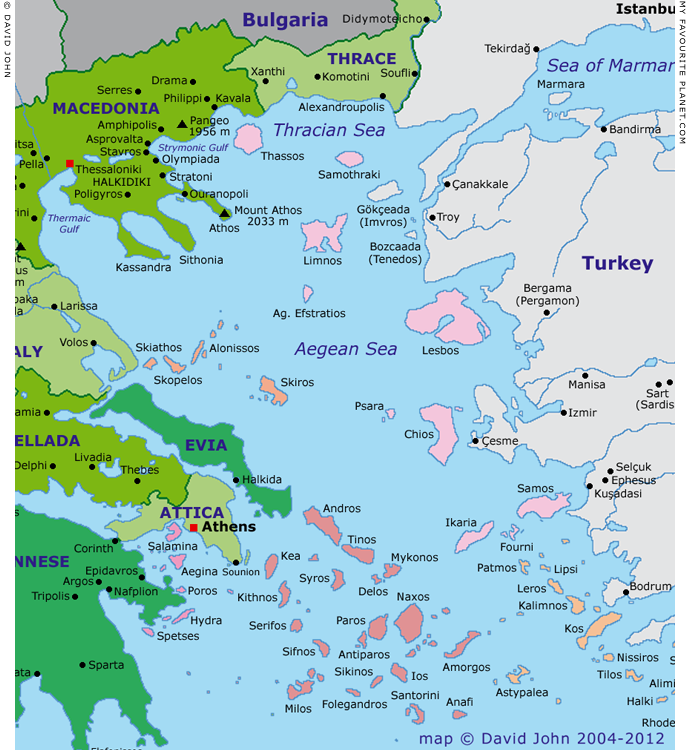 Psara became independent from Turkey and part of the modern Greek state on 21 October 1912, and in 1918 the community of Palea Psara (Κοινότητα Παλαιών Ψαρών, the Community of Old Psara) was founded at the location of the present village. There is very little tourism on Psara, few roads, no public transport and not a lot of accommodation. Some peole may consider it paradise. The small island of Antipsara (Αντίψαρα) is 3 km west of Psara. Greece page 4: Facts and figures. The harbour village on the west coast is the only settlement. are said to be a few rented rooms. The Kato Yalos pension has 5 rooms. with local fish and lobster specialities. on the west of the island. Airport: there is no airport on the island, although there is a helipad. Public transport: there are no buses or taxis on the island. Ferries to Psara are operated by NEL Lines www.nel.gr and SAOS Ferries www.saos.gr. a small port in southwestern Chios. If you have further information about travelling to Psara, please get in contact.